The robust and yet handy laser processing head was developed by the scientists of the LZH within the scope of the project "LaserRettung". The mobile, hand-guided laser head is designed to help emergency personnel in traffic accidents to quickly and safely separate vehicles in order to enable a speedy rescue of injured persons. Modern materials, such as high-strength steels and composites, offer greater safety in vehicles. For rescue services, however, this is a major challenge. 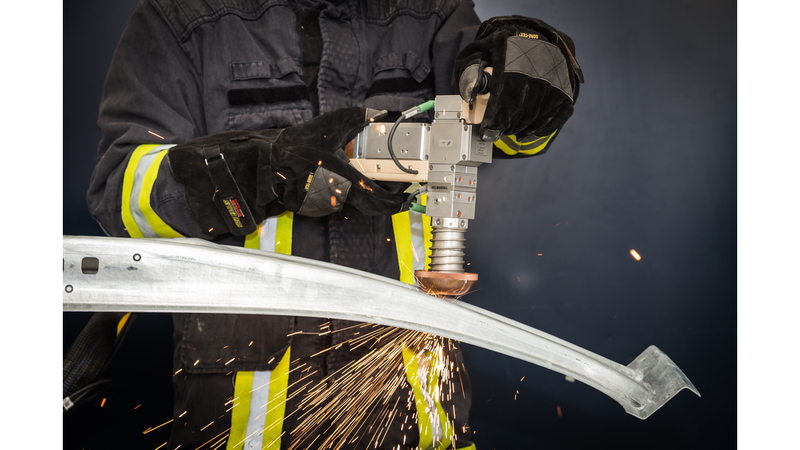 Conventional life-saving appliances, such as hydraulic scissors or cut-off wheels for rescuing accident victims, are more and more often reaching their performance limits. Therefore, the robustness, flexibility and practical suitability of the individual components are particularly important for the development of the laser rescue system. Among other things, the mobile laser processing head is characterized by its ergonomic shape. An additional handle with trigger button for the laser operation enables the safe two-hand operation. With a weight of 3 kg, the mobile processing head is also lightweight and compact. Optional drive systems are used to safely guide the head. The curved slide shoe allows for the processing of uneven surfaces, such as the cutting of a dented B-pillar of a vehicle. The laser safety is of great importance to ensure that neither the emergency personnel nor the injured persons or uninvolved third parties are endangered during in the rescue operation. Therefore, the laser processing head provides various safety components, such as a touchdown control and a visual signal transmitter for the laser operation. In addition, curtains, mats as well as cloths and glasses are provided to protect against laser radiation.